Joe Northwood carrying for Jed, with Clark Skeldon in support, as Hawick players make tackles (picture by Bill McBurnie). 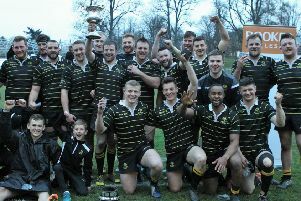 Jed-Forest saved their biggest and most important Christmas present to open until Boxing Day, unwrapping a hard-fought victory over rivals Hawick to regain the Skelly Cup and secure themselves an historic Border League finals place at a festive Mansfield Park. Jed gritted it out in a winter wonderland to book a first Border League final berth in 12 years and return the Skelly Cup to Riverside Park, after it spent eight years in Hawick’s trophy cabinet. This year’s showdown had slightly more bite to it than in previous years – Jed had announced they were forfeiting home advantage in the Border League to avoid fixture congestion at the end of the season, thus elevating Tuesday’s contest to a double header. Therefore the winner would not only claim the Skelly Cup, but also top spot in Pool B of the Border League and entry to the final. Greens captain Bruce McNeil and former Teri Sean Goodfellow had dotted down for both clubs on either side of half time in what was a tight, close-quarters contest. But it was the kicking from Ewan Scott, who added a conversion and penalty, that proved the difference for Jed. Ali Weir chipped over a second-half penalty for the Greens but was unable to convert his side’s first-half try. “We played well all day. I felt we controlled the game for most of it and those celebrations at the end were massive; it was a big win for us,” continued Young, who praised his side’s determination against tough BT Premiership opposition. “In the second half, I felt we dominated a lot more than in the first but there were moments when Hawick were working their way back into the game. “When they went ahead 8-7, it was a real moment for us to knuckle down and make sure the game didn’t get away from us. We were giving away too many penalties but the boys did well to get us back into it and we eventually got the result we wanted. With a late Christmas-evening temperature drop, the grounds crew at Mansfield Park did well to make sure this historic clash went ahead. The match itself started at a cagey, slow pace, with neither side showing much adventure out wide, remaining content to grind it out with up-the-jumper rugby. Greens captain McNeil eventually opened the scoring for the hosts with a well-taken, forward-orientated try, which would be the difference between the sides heading into the interval. Flying high in BT National One, Jed started the second half with a determination to lock in their biggest scalp of the season. The Riverside Park outfit controlled possession and that dominance eventually yielded a well-worked score for Goodfellow, who squeezed over after strong build-up play from his forward pack. Scott converted easily. Hawick regained their advantage when fullback Weir added a penalty after Jed had infringed at the breakdown, with a quarter of the contest remaining. But Scott would seal the historic win for Jed with a late penalty. Hawick: A. Weir, D. Lightfoot, K. Davies, D. Buckley, L. Ferguson, L. Armstrong, G. Munro, S. Muir, M. Carryer, D. Johnstone, D. Redpath, D. Suddon, G. Graham, S. Graham, B. McNeil. Replacements: F. Renwick, N. Little, R. MacLeod, A. Baillie, R. Gibson, G. Cotterll, M. Tait. Jed-Forest: L. Young, R. Marshall, G. Young, E. Scott, R. Shirra-Gibb, R. Yourston, S. Goodfellow, C. Hogg, C. Mackey, P. Ferreira, C. Skeldon, G. Law, A. Sanders, J. Northwood, D. Gillespie. Replacements: G. Paxton, J. Oliver, J. Hynd, D. Wardrop, C. Young, M. Mitchell.